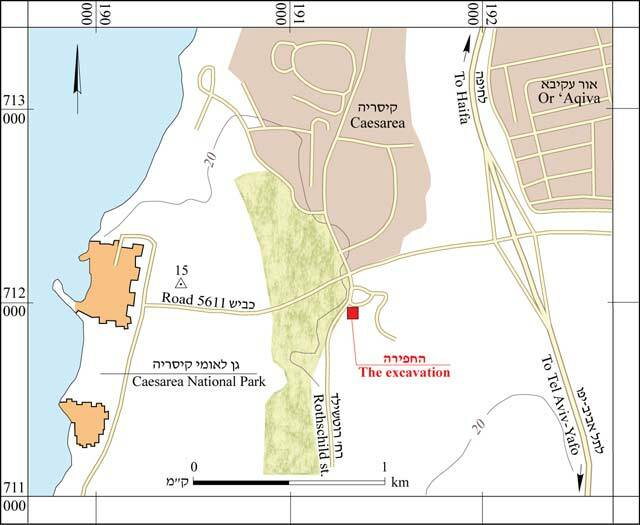 During July 2006 an excavation was conducted east of Rothschild Street in Caesarea and west of the golf complex, c. 70 m south of Golf Square (Permit No. A-4860; map ref. 19131/71201; Fig. 1), following the discovery of wall remains and plastered pits while overseeing the digging of a trench for an electric cable. The excavation, undertaken on behalf of the Israel Antiquities Authority and underwritten by the Israel Electric Company, was directed by P. Gendelman, with assistance from S. Yaʽaqov-Jam (administration), A. Hajian and S. Atkins (surveying and drafting), T. Sagiv (photography), A. Dagot (GPS) and M. Shuiskaya (pottery drawing). 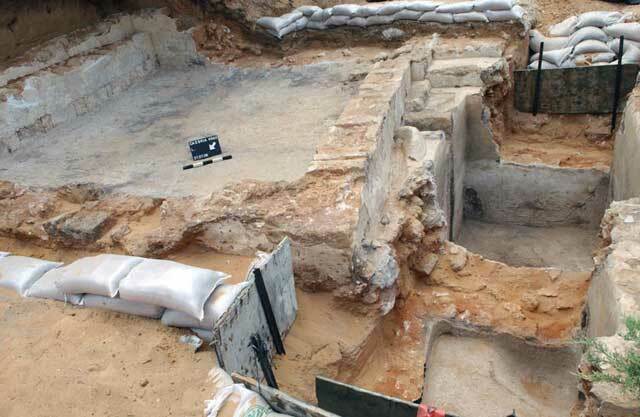 The excavation area was located at the edge of the ancient city of Caesarea, c. 200 m east of the eastern hippodrome and the Byzantine city wall. To date no archaeological excavations have been conducted in the region and no ancient remains were discovered apart from several tombs that were exposed while overseeing the digging of the trench, which were not excavated. 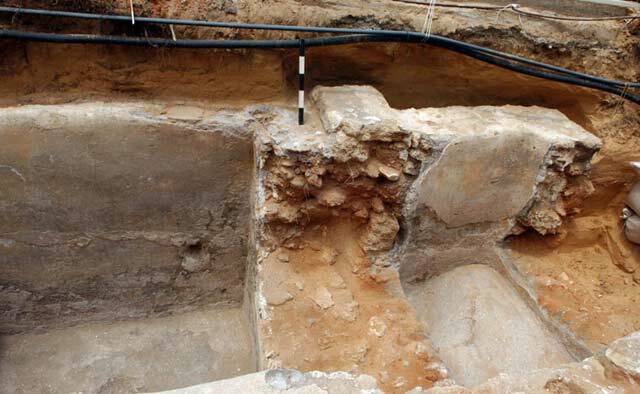 Approximately two and one half squares (62 sq m) were excavated in which a winepress dating to the Early Roman period was exposed. In the first phase the winepress included a square treading floor (L8; 3.9 × 3.9 m; Fig. 3) and a collecting vat (L7) west of it. The walls of the treading floor were built of ashlar kurkar stones arranged in alternating headers and stretchers bonded with hamra in between and treated with white plaster on the inside and outside (Fig. 4). The surface of the treading floor, made of white plaster that was applied to a bedding of gray mortar, was constructed on a foundation of kurkar fieldstones and hamra. 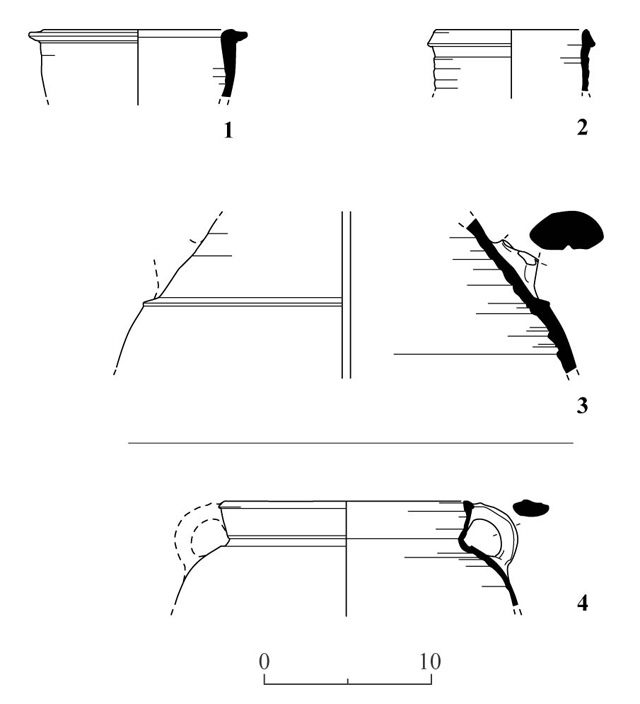 In the western wall of the treading floor a perforation was discovered that was connected to a wide gutter (L9; 0.4 × 0.6 m, depth 0.4 m) through which the must drained into the collecting vat (Fig. 5). The collecting vat was square (L7; 1.9 × 1.9 m, depth 2 m; 7.2 cu m), built of large kurkar fieldstones and hamra, and its sides and floor were treated with white plaster applied to a base layer of gray mortar (Fig. 6). 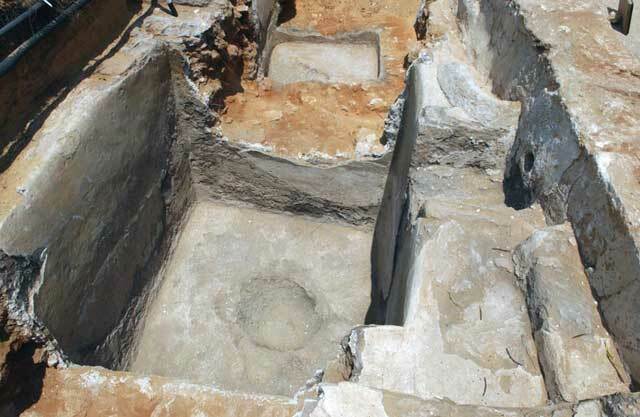 A circular sump (diameter 0.8 m) was located in the middle of the floor of the vat. Close to the northwestern corner on top of the side of the vat, a round plastered depression (diam. c. 0.15 m, depth 0.15 m) was exposed that was probably where jars were placed when they were being filled with must from the collecting vat. In the second phase several modifications were made to the winepress: the walls enclosing the treading floor were raised c. 0.3 m; the treading floor itself was raised and replaced with a white plaster floor founded on gray mortar mixed with fragments of pottery vessels; north of the collecting vat another smaller, shallower vat was built (L6; 0.90 × 1.15 m, depth 1.2 m) with a sump in the southwestern corner (Figs. 6, 7). At the same time that the vat was built the through-hole that connected the old treading floor with the collecting vat was sealed. On top of the side that separated the treading floor from the vats a plastered channel (L10) was constructed that led from a new through-hole that was created connecting the western side of the new treading floor to the new vat. Because of damage caused while digging the modern trench it is unclear if a channel or through-hole linked the two vats. In addition, all of the walls of the wine press and the sides of the vats were re-plastered. 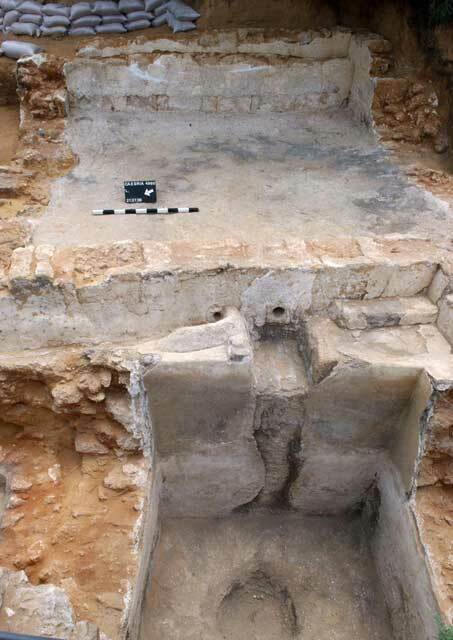 It seems that the vat that was built in the second phase (L6) was used as a filtration vat from which it can therefore be inferred that white wine was produced in the installation. It seems that the wine press was used for only a short period after which it was covered over with sand. 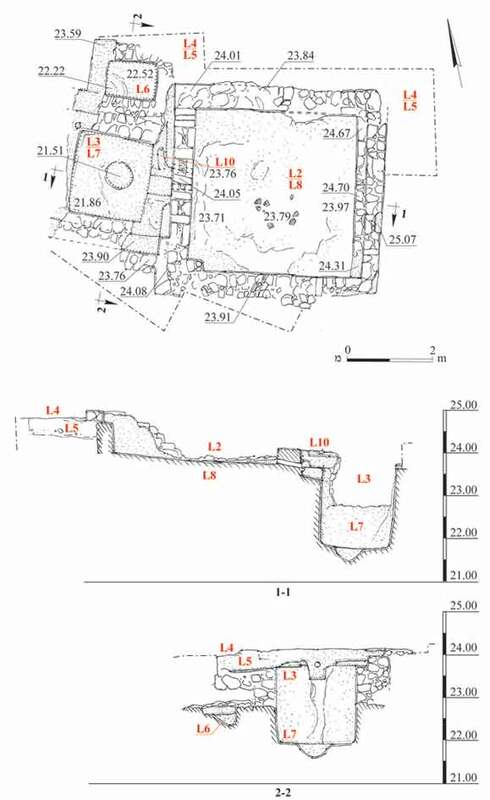 The ceramic artifacts recovered from above the treading floor pavement and from the habitation level around the wine press (Loci 2, 4) include a jar (Fig. 8: 1) and amphorae (Fig. 8: 2, 3) that date the construction and use of the winepress to the end of the first century BCE-beginning of the first century CE. The few pottery vessels that were discovered in the sand dune that filled the collecting vat after the winepress was no longer being used (L3) included a cooking pot (Fig. 8: 4) and date the end of the installation’s use to the end of the first century-beginning of the second century CE. The winepress that was exposed was built about the time the city of Caesarea was founded.Its proximity to the city and dimensions indicate it was designed for wine production, not just for the personal needs of the owner of the vineyard but also for sale in the markets of the developing city. 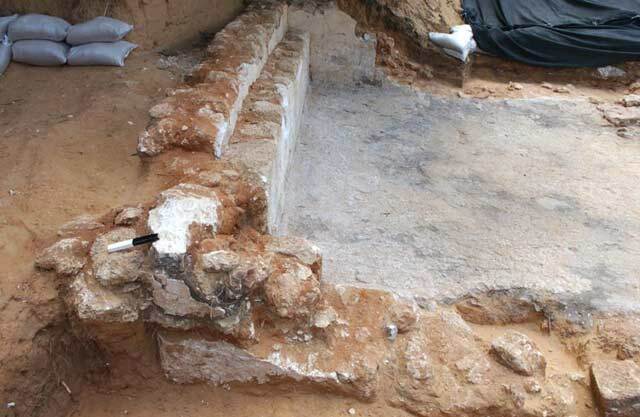 The proximity of the winepress to the city precincts indicates that the agricultural activity, including the growing of grapes and production of wine, also occurred in the immediate vicinity of Caesarea. The reasons why the wine press was abandoned are unclear; it probably happened close to the time of the Great Revolt and was most likely connected to the events that transpired around the city during this period. 2. Winepress, plan and sections. 4. Treading floor, looking south. 5. Collecting vat, the gutter and the treading floor, looking east. 6. Collecting vat, looking north. 7. Collecting vat and Vat 6 to the north of it, looking west.